During the First World War The Bristol Lunatic Asylum (Glenside Hospital) was requisitioned by The War Office and became The Beaufort War Hospital. It took three months to convert the building. The day rooms and the twenty-four night wards became medical and surgical wards; corridors were refurbished to cope with emergency admissions, and two operating theatres were built. The majority of the asylum patients were relocated to hospitals in the West Country, however some 40 patients remained to work in the kitchens and the laundry. The first convoy of wounded arrived at Beaufort on May 24th 1915. Beaufort specialised in orthopaedics, under the command of surgeon and Doctor Edward Hey Groves. 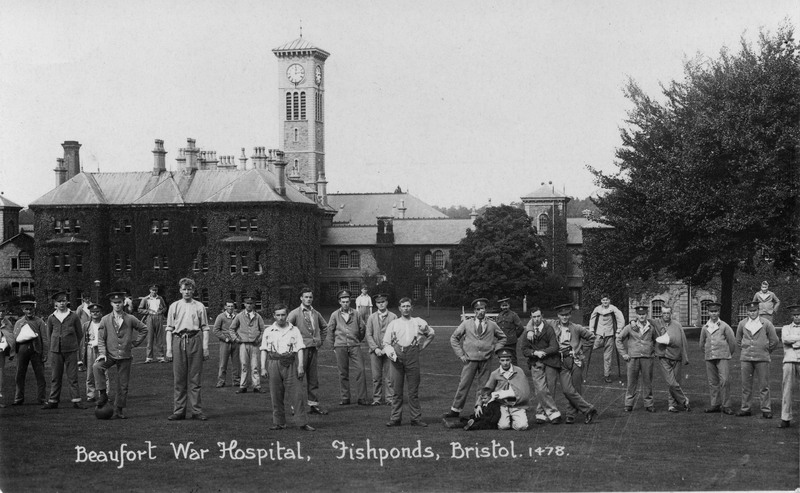 The shrapnel and gunshot wounds provided a steady stream of patients, and by 1916 The Beaufort became the Orthopaedic Centre for the South West. The hospital attracted international staff, there were doctors from Canada and New Zealand, and Australian nurses who enlisted in QAIMNS. The Hospital also treated soldiers suffering from the effects of mustard gas. Thirty beds were reserved for mental health cases among local troops; and in 1917 a ward of ten beds was established for cases of sickness among the German prisoners of war in the labour camps near Bristol. The greatest number of patients sleeping under the roof of the Beaufort War Hospital on one night was 1,487. Nearly 30,000 soldiers were treated at The Beaufort, and only 164 deaths recorded, 30 of which were civilian emergencies from the influenza epidemic of 1918. The hospital closed in February 1919 and returned to its role as a civilian psychiatric hospital.